I neglected to take sufficiently detailed process photos while I was working on Autumn Arbor, but for those of you who have some bead weaving experience, it's probably easy enough to figure out. Three basic stitches were used to create the components, and then these pieces were woven together and embellished using the thread tails: tubular herringbone, freeform right angle weave, and spiral square stitch. Autumn Arbor was a finalist in the Fire Mountain Gems and Beads 2009 beading contest, and you can see it featured on their site. 1. 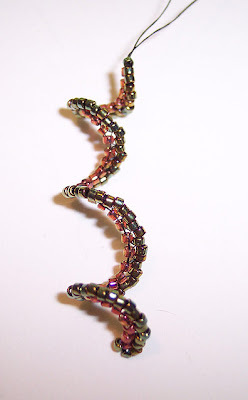 Create a long tube for the foundation of the necklace, using tubular herringbone stitch. 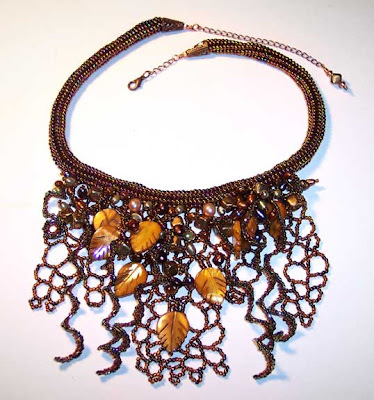 A wonderful tutorial can be found at Beadwork at About.com, written in 1998 by Emily Hackbarth. 2. 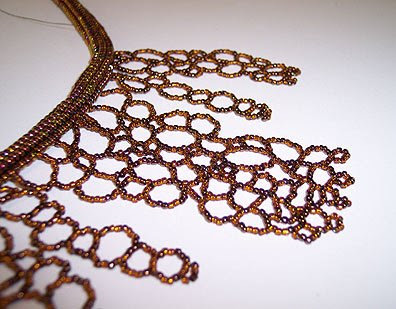 Use single-needle freeform right angel weave (RAW) to create the open-worked panels hanging from the tube. Leave long tails on each so that you can later stitch them to the tube and add bead embellishments. 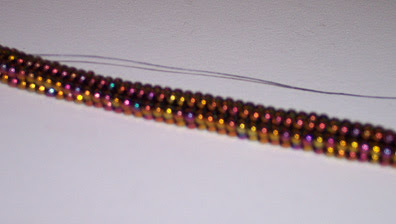 Deborah Roberti, at Around the Beading Table, wrote a good straightforward tutorial on basic RAW. To stitch freeform RAW, add random numbers of beads each time instead of the standard three. 3. Stitch spiral square stitch tendrils, leaving long thread tails on them as well. 4. Stitch all the components together, using the thread tails. Add pearls and leaves (or other beads) to strategic spots on the RAW panels. ¡¡Simply marvelous!! I like it a lot. Thanks and huges. Wow, that is just breathtaking! What beautiful colors and amazing beadwork. It is the perfect Fall piece. Thank you so much for sharing your design. I love the look of this with the leaves too! Really pretty! 10 out of 10!! Thanks for sharing. Will link from my blog! Great, Kelly! Glad you like!